1971 saw the introduction of the Copper-Nickel Clad Half Dollar, ending a tradition of over 175 years of Silver (or part Silver) Half Dollars. The Treasury raised the price of the Mint Sets to $3.50, but added an extra Half Dollar to compensate for some of the difference. 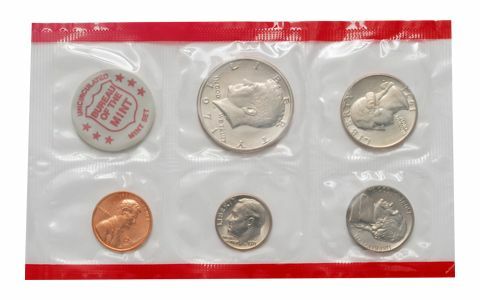 The Eisenhower Dollars, which debuted in 1971, were NOT included in the official Mint Sets; instead, the regular strikes were released directly into circulation. 40% Silver Clad versions of the 1971-S Eisenhower Dollar were sold individually to collectors at a premium (known as "Blue Ikes"). 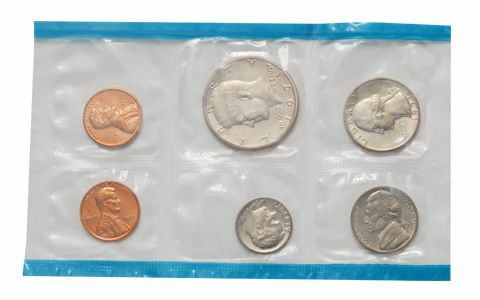 The coins were sealed in a flat pliofilm pack and placed in a glossy blue envelope). 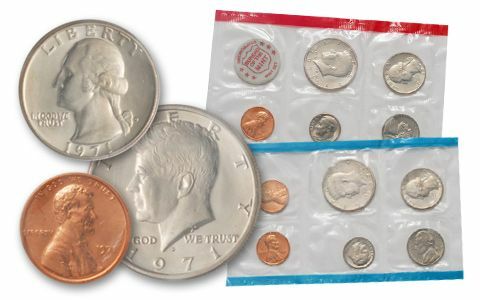 About the sets: The coins in the 1971-PDS Mint Sets were Uncirculated pieces pulled from regular production runs, thus the quality of the individual coins varies widely from set to set, and even within a set. 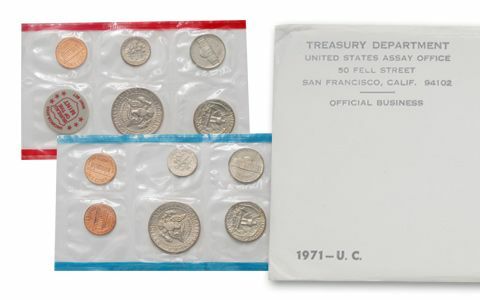 Original packaging: The coins in the 1971-PDS Mint Set were sealed in two pliofilm flat packs: the D-Mint coins were placed together in one of the packs, and the P- and S-Mint coins were placed together in another. A disk identifying the Denver Mint was included along with the D-Mint coins. The pack containing the D-Mint coins was edged in red; the pack containing the P- and S-Mint coins was edged in blue. The two pliofilm packs and two pieces of thin cardboard (for protection) were sealed in an officially inscribed mailing envelope. The 26th Amendment to the U.S. Constitution granted eighteen-year-olds the right to vote. The London Bridge was dismantled, brought to the United States, and rebuilt in Lake Havasu City, Arizona. The U.S. Ping-Pong team accepted an invitation to play in China. General Idi Amin seized power and became dictator of Uganda.